Waiting For Battlestar Galactica Online? Get A Jump On The Competition! Tactical Space Combat MMOG from Bigpoint is Based on Syfy’s International Hit Television Series and Features Characters Number Six, Starbuck, Boomer and More! NEW YORK – February 2, 2011 – Players eagerly awaiting Battlestar Galactica Online, the highly anticipated space combat MMOG from Bigpoint (www.bigpoint.com/), can get a ‘jump’ on the competition and be the first to launch a Colonial Viper or Cylon Raider by visiting Syfy.com and Syfy.co.uk where the open beta for the new game will be available exclusively for one week only beginning Tuesday, February 8th*. Also available to players only at Syfy.com – and international Syfy Universal websites – are a frakkin’ awesome set of Syfy-inspired Viper and Raider designs, which players can choose to represent them in the on-going battle between the Colonial and Cylon fleets. 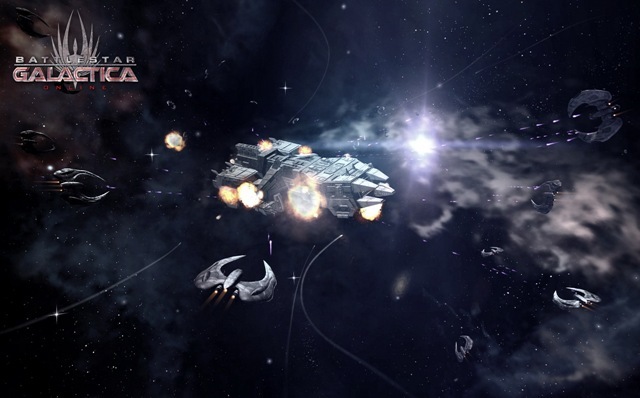 Battlestar Galactica Online (http://battlestar-galactica.bigpoint.com/) is a free-to-play, browser-based space combat MMOG that combines high-quality, 3D graphics with intense gameplay. Bigpoint – the global market leader in browser-based massively multiplayer online games (MMOGs) – designed and produced the game, which is based on Syfy’s award-winning, internationally popular television series Battlestar Galactica, produced by Universal Cable Productions. In addition to the exclusive one week open beta period at www.Syfy.com and Syfy.co.uk, Syfy will also be Bigpoint’s exclusive media partner for a period of six weeks with exclusive marketing rights in the US (http://www.syfy.com/battlestargalacticaonline) and UK (http://www.syfy.co.uk/battlestar-galactica-game). Syfy Universal will also make the game available on its other international websites in Germany (http://www.syfy.de/battlestar-galactica-game), France (http://www.syfyuniversal.fr/battlestar-galactica-online), Spain (http://www.syfyuniversal.es/battlestar-galactica-juego), Poland (http://www.scifiuniversal.pl/battlestar-galactica-game), and Russia (http://www.syfyuniversal.ru/battlestar-galactica-game). Additional Syfy Universal international websites will be added in the weeks following launch. Battlestar Galactica Online is based on the acclaimed Emmy and Peabody Award-winning television series “Battlestar Galactica,” from Universal Cable Productions, which aired for four seasons on Syfy. In the game, humans and Cylons are in a constant struggle to control the universe. A blend of tactical space combat, exploration, and mission-based gameplay will provide a diverse experience. Assets from the television production have been integrated into the game to deliver an authentic experience. With beautiful graphics and innovative gameplay, Battlestar Galactica Online will set a new standard for browser-based MMOGs. The game is being developed by Artplant (http://artplant.no), a Norwegian studio that specializes in MMOGs. Bigpoint (www.bigpoint.com) is an online-game publisher, content provider for large media concerns and browser-based game developer. Bigpoint-developed games are played by over 170 million people in more than 25 languages, are free to play anytime, anywhere, and require no download or installation. The company’s portfolio includes games in a quality which until now was associated exclusively with console games or PC-installed games. More than 700 employees from over 35 different nations work at the company headquarters in Hamburg, Germany or at other locations in Berlin, San Francisco, and Malta. For more information or press material, please visit the press area at www.bigpoint.net. Battlestar Galactica Online screencap courtesy Syfy. Previous PostQuietly Beautiful, Never Let Me Go Explores Love, Life and the Soul!Next PostHarry Potter Film Franchise Receives Outstanding Contribution to British Filmmaking Award!